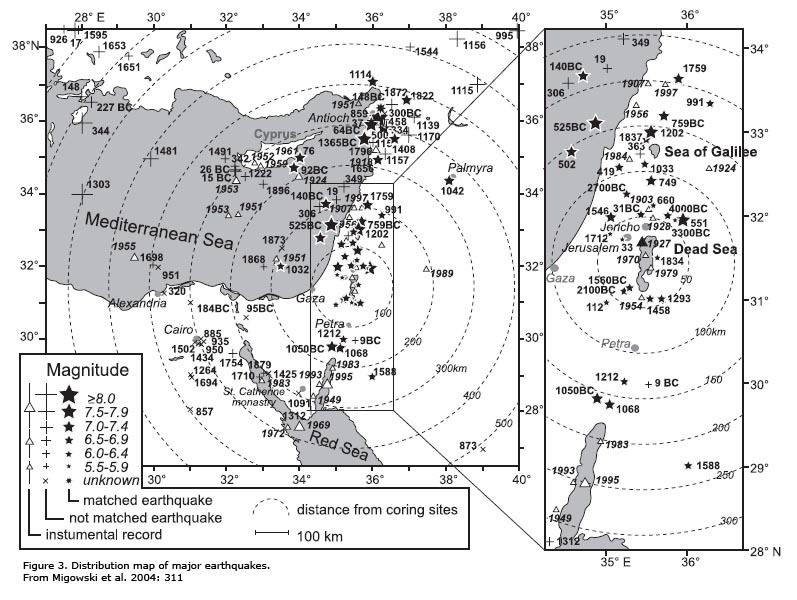 This page reviews the subject of earthquakes, and maps to a sample of sites that were affected by the quakes. Matthew 28 2: "And, behold, there was a great earthquake...". 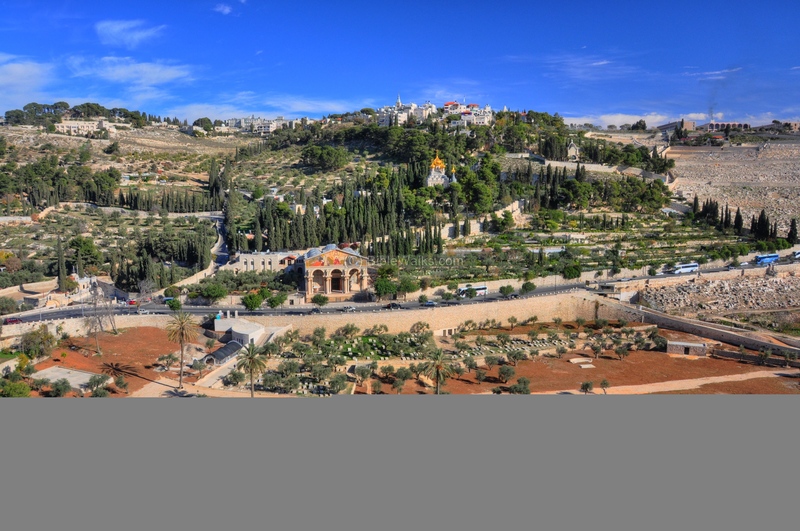 The Holy Land is a region where earthquakes occur frequently. Devastating quakes have been documented during thousands of years, causing damages to structures and people. Many structures have been repaired, rebuilt or abandoned over the years, as attested in most of the historical sites. This web page provides a summary of the greatest quakes, a sample list of sites where the earthquakes caused damages, links and references to additional information. We thank Prof. Amotz Agnon for the assistance in preparing this web page. Click on header to jump to site. The large city was leveled by a massive earthquake in 749 AD, and was in ruins until recent archaeological excavations which are unearthing and reconstructing this amazing city. The earthquake leveled the structures and colonnaded streets, as seen in the picture. Click on the photos to enlarge them. The great Roman and Byzantine city of Lower Galilee; capital city and major Jewish center during the Byzantine period. 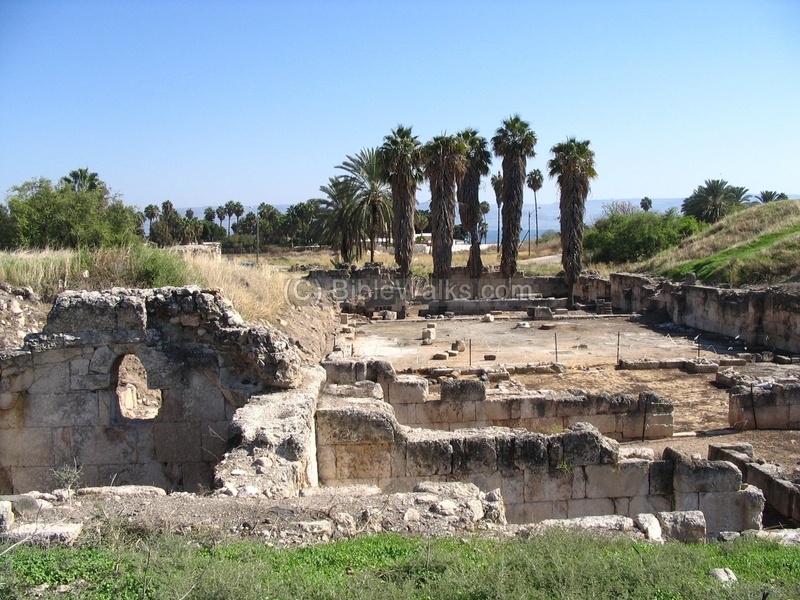 The city was heavily damaged by nature - a major earthquake (363 AD) hit most of the cities in the Galilee and Israel. It was rebuilt and continued to flourish until the decline in the Arab period (7th C). Hippos (Sussita) is an ancient city located on the plateau of a diamond shaped mountain by the eastern shores of the Sea of Galilee. A major earthquake devastated the city on Jan 18 749 AD: it toppled most of the buildings, knocking down its massive pillars, killing tens of thousands in the region. The few citizens who survived the quake relocated to other sites in the Golan. The city laid in ruins since then, totally covered by the debris. The Nimrod fortress (Qal'at Namrud, Qal'at Subeiba) is one of the largest and most impressive fortresses in Israel. 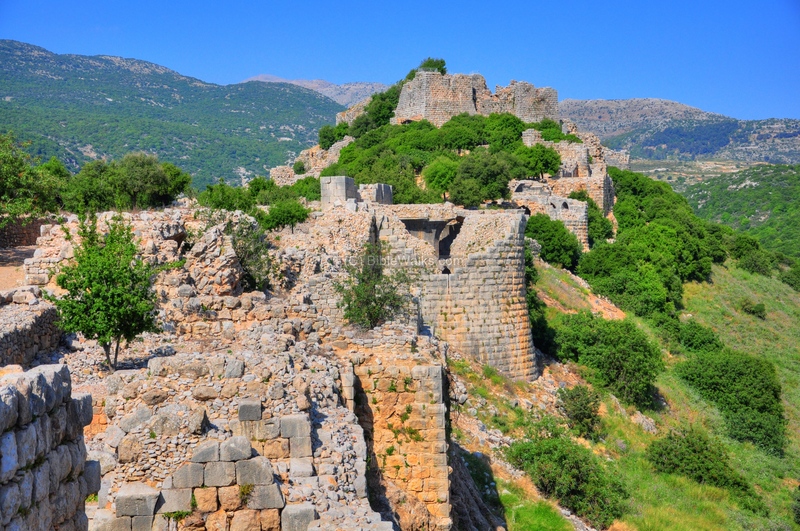 The fortress guarded the main road from Tyre and Tiberias to Damascus during the Crusaders period. An earthquake in 1759AD shocked the fortress and caused damages. A 5th C AD monastery in Mishor Adummim, on the road from Jerusalem to Jericho and the Jordan valley. It was founded by the hermit Euthymius "the Great" in 428AD as a Laura (or Lavra - a monastery of hermits, with small cells). The monastery was severely damaged in the 659AD earthquake, and most of it was rebuilt within several years. The prophet Zechariah describes that an earthquake will split Mount of Olives to 2 parts, south and north, and describes the horrors of that day which will be recognized as God's acts, but will be followed by a salvation. (Zechariah 14): "...and half of the mountain shall remove toward the north, and half of it toward the south. And ye shall flee ... like as ye fled from before the earthquake in the days of Uzziah king of Judah: and the LORD my God shall come, and all the saints with thee". 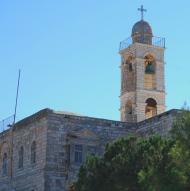 A 12th C Greek-Orthodox monastery, on the side of the road from Jerusalem to Bethlehem. Built over the ruins of a Byzantine church, it serviced the pilgrimage route to Bethlehem. The monastery was severely damaged by an earthquake (1160AD), after a previous quake (1033/4) already shattered the structure. 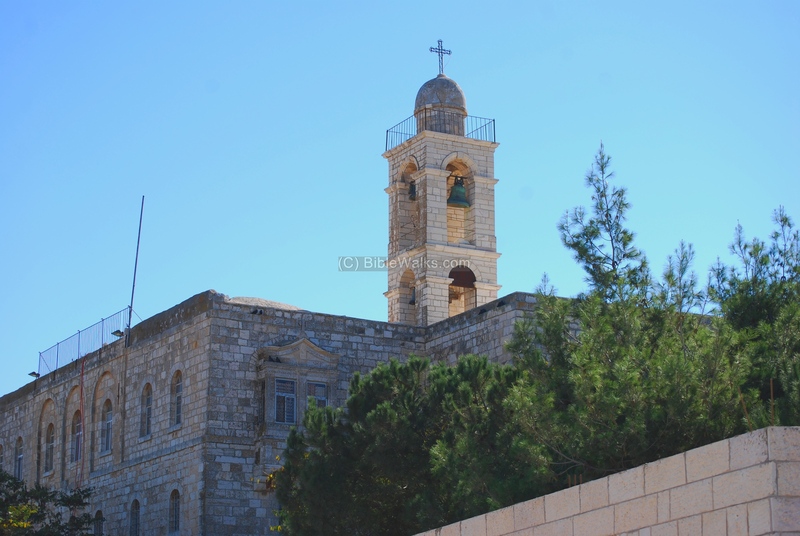 Immediately after the quake, the monastery was built again during the Crusaders period. Ruins of a grand winter palace for the Arabic rulers from Damascus. Built in the 8th C AD near Tell Kinneret. The palace was destroyed in a severe earthquake (749AD). Located on the western shore of the sea of Galilee, this city is one of the Holiest Jewish cities for almost 2000 years. In 749AD the great earthquake destroyed most of the structures in the area. Ruins of a famous Roman period settlement on the north-western shore of the Dead Sea. This was the home of the Essenes, a break-away sect. 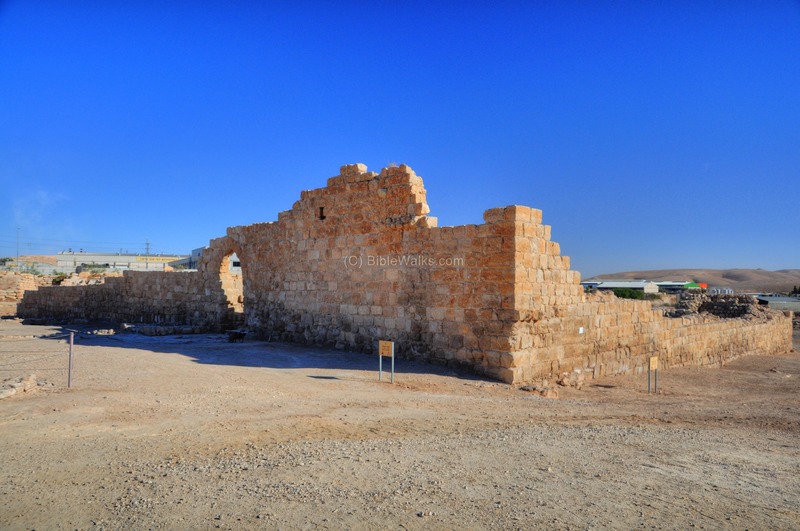 After the earthquake of 31BC in the Jordan valley, during the times of King Herod the Great, the settlement was severely damaged and deserted. The Essenes returned to rebuild the site in 4BC. 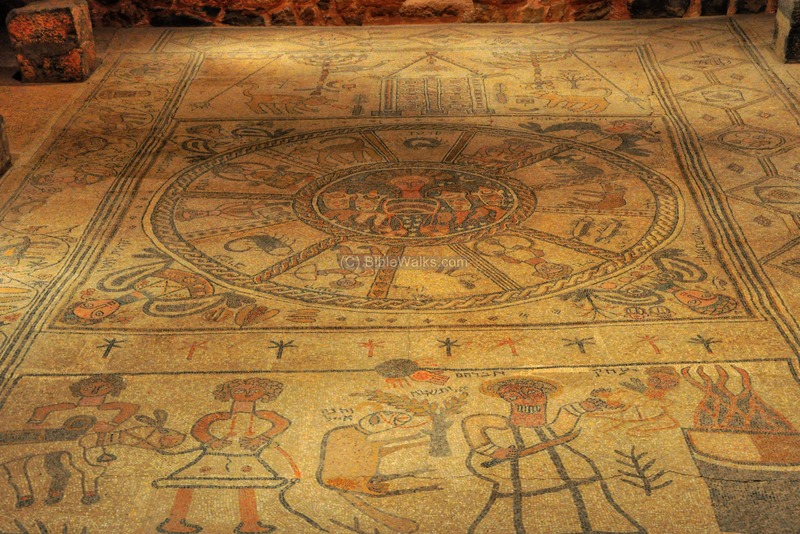 An ancient synagogue from the Byzantine period, where a beautiful mosaic floor was found, illustrating a Zodiac, the Ark, and the binding of Isaac. The synagogue continued to function under Arab control, but was destroyed in the massive earthquake of 749AD which leveled many of the towns and cities in the region. It remained in ruins until the 20th C.
Tell Aphek (Afek, Antipatris) was a gateway on the main trade route from north to south. 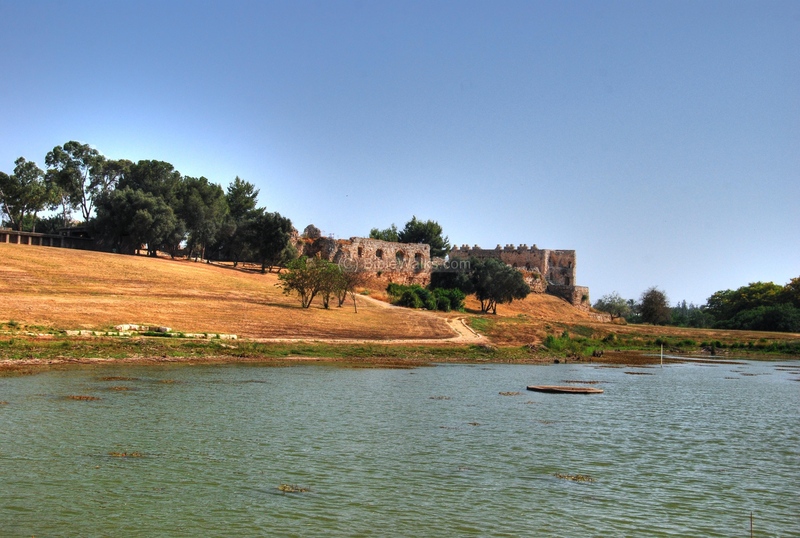 More than 6,000 years of successive cities have been built on the mound overlooking the springs of the Yarkon river. The city was damaged by a massive earthquake in 363 AD, when most of the cities in the Galilee and Israel sustained severe damages. The city did not recover - during the Byzantine period it was a small military station. On the north and south walls of the ruined fortress are cracks, 2.1m wide, evidence of the earthquakes that shocked the area since the construction of the fortress. According to the study by R. Ellenblum et. al, the displacement was caused by the great earthquake of May 20, 1202 (causing a 1.6m offset), then again in the earthquakes of 1759 and/or 1837 (additional 0.5m offset). The fault line crosses the length of the fortress. A white roof was constructed above the point where the fault passes the north wall, in order to record the movements of the earthquake fault line. The Bible has many descriptions of earthquakes, describing the fierce forces of the quakes and its affect on men. Exodus 19 18: "And mount Sinai was altogether on a smoke, because the LORD descended upon it in fire: and the smoke thereof ascended as the smoke of a furnace, and the whole mount quaked greatly." Numbers 16 31-32: "|And the earth opened her mouth, and swallowed them up, and their houses, and all the men that appertained unto Korah, and all their goods. They, and all that appertained to them, went down alive into the pit, and the earth closed upon them: and they perished from among the congregation". 1 Samuel 14 15: "And there was trembling in the host, in the field, and among all the people: the garrison, and the spoilers, they also trembled, and the earth quaked: so it was a very great trembling". 1 Kings 19 11-12: "And he said, Go forth, and stand upon the mount before the LORD. And, behold, the LORD passed by, and a great and strong wind rent the mountains, and brake in pieces the rocks before the LORD; but the LORD was not in the wind: and after the wind an earthquake; but the LORD was not in the earthquake: And after the earthquake a fire; but the LORD was not in the fire: and after the fire a still small voice". Amos prophets on the coming earthquake of 759 BC (Amos1 1): "The words of Amos, who was among the herdmen of Tekoa, which he saw concerning Israel in the days of Uzziah king of Judah, and in the days of Jeroboam the son of Joash king of Israel, two years before the earthquake". Zechariah 14: "...and half of the mountain shall remove toward the north, and half of it toward the south. And ye shall flee ... like as ye fled from before the earthquake in the days of Uzziah king of Judah: and the LORD my God shall come, and all the saints with thee". Micah also witnessed the quake of 759 BC (Micah 1 4): "And the mountains shall be molten under him, and the valleys shall be cleft, as wax before the fire, and as the waters that are poured down a steep place". The major earthquake of 31 BC (magnitude 7) was one of the largest in 2,000 years. It destroyed cities in the Western Jordan valley (such as Masada, Qumran and Jericho), as reported by Josephus Flavius (Ant. XV, Chapter 5): "At this time it was that the fight happened at Actium [BW: 31 BC], between Octavius Caesar and Antony, in the seventh year of the reign of Herod and then it was also that there was an earthquake in Judea, such a one as had not happened at any other time, and which earthquake brought a great destruction upon the cattle in that country. About ten thousand men also perished by the fall of houses...". The quake of 33AD, after Jesus was crucified (Matthew 27 51, 28 2): "And, behold, the veil of the temple was rent in twain from the top to the bottom; and the earth did quake, and the rocks rent"..."And, behold, there was a great earthquake: for the angel of the Lord descended from heaven, and came and rolled back the stone from the door, and sat upon it". An earthquake released Paul and Silas (Acts 16 26): "And suddenly there was a great earthquake, so that the foundations of the prison were shaken: and immediately all the doors were opened, and every one's bands were loosed". Recurrence pattern of Holocene earthquakes along the Dead Sea transform revealed by varve-counting and radiocarbon dating of lacustrine sediments (pdf; Migowski, Agnon, et al; 2004) - recommended! "Rock fall hazard evaluation down the Gilboa fault slope: Hefziba and Beit-Alfa" [Yuval Levy, Hebrew Univ. Thesis, 2014; 106 pages, Hebrew with English abstract] This study alerts on the danger of a 5+ magnitude earthquake to the people of the Kibbutz, due to falling rocks from Mt Gilboa. Sep 13, 2018 update: Budget has been allocated to reinforce the cliff, thanks to Uncle Ronnie who pushed to prevent the hazard. 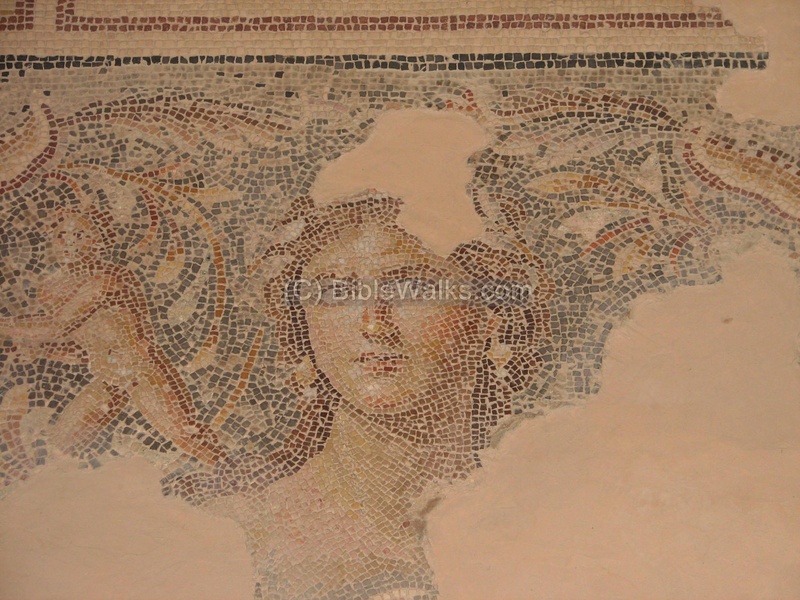 See also site review of Beit Alfa and Hehziba.